Other crafty stuff I've been upto. 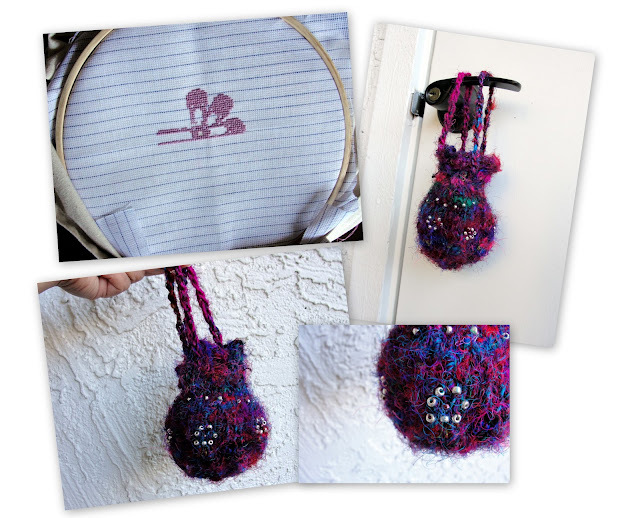 Some cross stitching (on a canvas tote bag) and I finally embellished the coin purse I blogged about earlier. All the purse now needs is a light colored lining, it's pretty dark in there. The canvas tote is a simple plain natural colored canvas tote. I'm using a 14 count waste canvas to cross stitch a simple flower on it, or if I'm upto it, 3. It's fun and relaxing to cross stitch between all the knitting. Thank you Kim! Dropping by your blog now! Adding the beads to the coin purse was a nice touch! Thanks Kristin! The photos don't do any justice at all to how it actually looks. Still learning.